A corporate trainer, also known as a training and development specialist, is a professional who is responsible for designing and implementing training programs for employees to help enhance their knowledge and skills. This is a rewarding profession for those who like interacting with others, public speaking, designing programs and curriculum, and analyzing results. In addition, professionals in this field typically work regular business hours and rarely have required overtime. 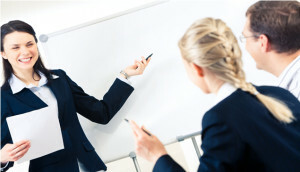 Read on to learn how to become a corporate trainer and what to expect from this field. While a bachelor’s degree is usually required to become a trainer, there is some flexibility about the major you choose. Good options include education, psychology, communications, or human resources. In addition, as technology plays an increasing role in the modern workplace, candidates with a dual degree or minor in information technology or computer science are especially desirable. Although only a year or two of experience is required to become a trainer, employers typically prefer candidates who have already worked in the industry in which they want to be a specialist. This helps give them the knowledge base necessary to develop the curriculum, presentations, and modules that will be needed for the educational programs. Work experience in training and development, instructional design, teaching, and information technology are all considered desirable; consider getting a part-time job in one of these fields as you complete your degree, such as working as a tutor in your college learning center. Although certification is not required, pursuing continuing education or a certification from an organization like the Association for Talent Development or the International Society for Performance Improvement, can help supplement your skills and make you more attractive to employers. Both offer a variety of courses and certifications within the realm of training and development. The median annual wage for training and development specialists is $55,930, though salaries range from as low as $31,910 to as high as $93,470. The highest earnings in the field are in the industries of professional, scientific, and technical services, educational services, finance and insurance, and health care. Beyond salary, this field is desirable because of the high growth rate which is projected to be 15 percent over the next 10 years, meaning a possible 35,400 new jobs. Innovations in learning technology, the need to train a new workforce as baby boomers retire and the need for continuing education in most industries are expected to drive this growth. If you want to move up in this field, you can consider becoming a training and development manager, which usually requires a bachelor’s degree and at least five years of experience. If you love working with people and desire a solid career with plenty of growth potential, consider becoming a training and development specialist. A job as a corporate trainer is not only fulfilling, but it can also be fun. This is especially true if you love to teach and learn.